The U.S.S. 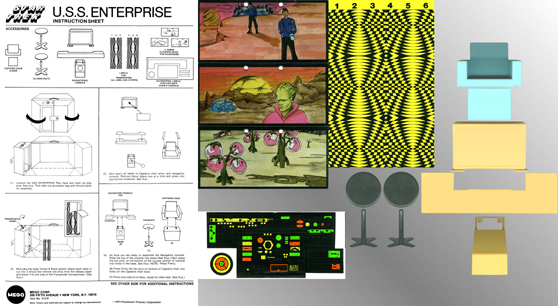 Enterprise Playset (Item No. 51210)...nothing says "Mego" quite like this little gem. This accessory gives the Emerald City and the Batcave heavy competition for most popular Mego playset ever. 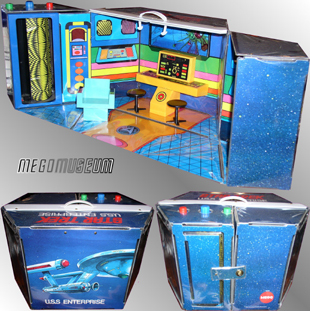 If not the most popular, it is certainly the most prevalent; observing the sheer number of these playsets that were produced really drives home just what a best-seller the "Star Trek" line was. Clearly, judging from the color scheme, the team behind the Mugato design also came up with this beauty--but somehow, against all logic, it works. It is about as far from accurate as you can get, but it just reeks of play value I imagine it is exactly what the bridge of the Enterprise would look like if filtered through the eyes of an unassuming six-year-old..
* The Handle: This is not just a playset...it's a carrying case, for on-the-go fun with the Enterprise crew! You can take it with you to school, to a friend's house, to your grandmother's...like Visa, it's everywhere you want to be! * The Display: Not all of Mego's lines were lucky enough to have a ready-made diorama for future collectors. 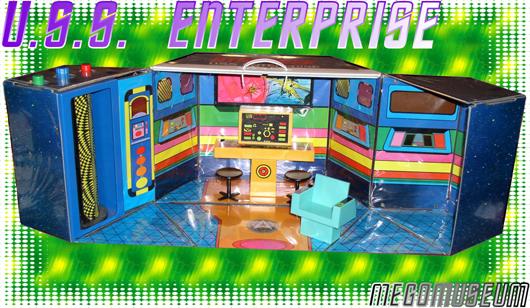 The Enterprise Playset is one-stop-shopping for your most basic display needs. * The Transporter: Probably one of Mego's greatest contributions to the toy industry is this little innovation. It looks and acts nothing like the "real" transporter, but it's hella-fun! Sure, Playmates used lights, batteries and mirrors for their Transporter, but you can't top Mego's iteration for pure style. (Glide your mouse over the image to the right to take the Transporter for a test-spin!) Mego would re-use this mechanism for the Munchkinland Playset, Palitoy's Transporter Room, and Denys Fisher's TARDIS. * The Price: The Enterprise was overproduced to a fault. (In fact, sometimes it seems like it's almost easier to find a loose, mint Enterprise than a loose, mint Scottie!) Thanks to the sheer number of these toys, they can be had for next-to-nothing. On a good day, you can even find one mint-in-box on eBay for under a hundred bucks! No excuses--if you collect Mego "Trek," you need this now. 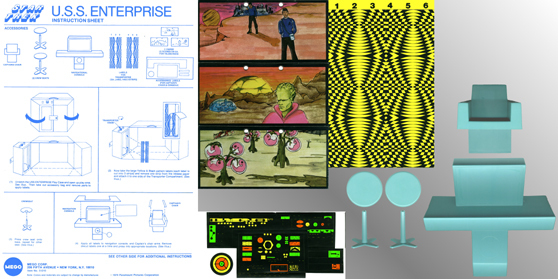 * The Innocence: The Enterprise Playset is more than just a collectible--it's a link to a time of wonder and innocence, when every toy didn't have to use batteries, when every vehicle didn't have to come right off of the art director's blueprints, when every playset didn't have to adhere to a preset chart of paint chips and pattern swatches. I dare you to spin that Transporter and not feel like a kid again. Let's see if we can make sense of this, shall we? * The Instruction Sheet is printed in blue ink and is slightly shorter than the one that comes in the "mixed" set (see below). * The Captain's Chair and Console are molded in one piece rather than multiples like the "mixed" set (see below). Note the differences in the instruction sheet which call accommodate this fact. * The furniture in the "blue set" is not marked with manufacturer indicia, unlike the "mixed" set (see below). * The Instruction Sheet is printed in black ink and is slightly taller than the one that comes in the "blue" set (see above). * The Captain's Chair and Console are molded in multiple pieces rather than one like the "blue" set (see above). Note the differences in the instruction sheet which call accommodate this fact. 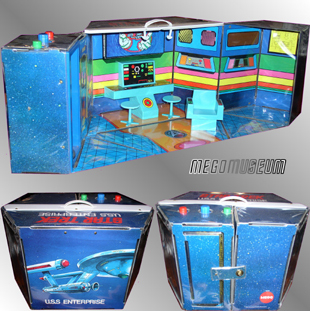 * The furniture in the "mixed" set is marked with indicia which reads, "MEGO HONG KONG," unlike the "blue" set (see above). This is the "standard" box. The vast majority of Enterprise Playsets are to be found in this packaging. 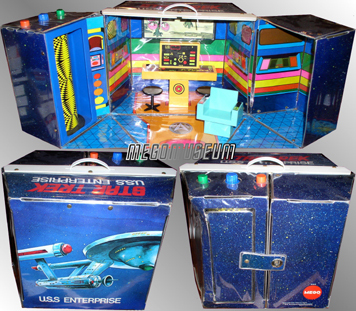 This is the mail-order "catalog" box for the Enterprise Playset--an exceptionally hard find. Note: This is not an outer carton containing an inner box. This IS the box for the playset. 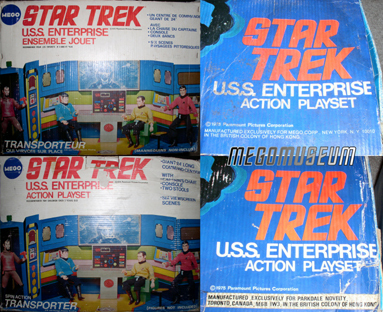 These are the two "foreign" boxes for the Enterprise Playsets released in France and Canada. The boxes are smaller than the "standard" domestic one due to the smaller size of the playset itself. Both boxes have a front that is written in French (see upper-left quadrant), and a back that is written in English (see lower-left quadrant). In fact, both boxes are identical, with one small exception: the Canadian box has a Parkdale Novelty sticker (see lower-right quadrant) covering the manufacturing information on the top of the box (see upper-right quadrant). Special Note: This foreign Enterprise was actually designated with a separate stock number. Both the Canadian and French playsets are Item NO. 51210/F. VARIANT #1: Standard vinyl playset PLUS "blue" set of accessories INSIDE a "standard" box. VARIANT #2: Standard vinyl playset PLUS "mixed" set of accessories INSIDE a "standard" box. VARIANT #3: Standard vinyl playset PLUS "blue" set of accessories INSIDE a "catalog" box. VARIANT #4: Standard vinyl playset PLUS "mixed" set of accessories INSIDE a "catalog" box. VARIANT #5: Smaller foreign vinyl playset PLUS "mixed" set of accessories (single-sheet Transporter labels pre-affixed) INSIDE a French-language box. VARIANT #6: Smaller foreign vinyl playset PLUS "mixed" set of accessories (single-sheet Transporter labels pre-affixed) INSIDE a French-language box with a Parkdale Novelty sticker on top.